The moorages of the main Russian Northern Navy Fleet's base in the town of Severomorsk. 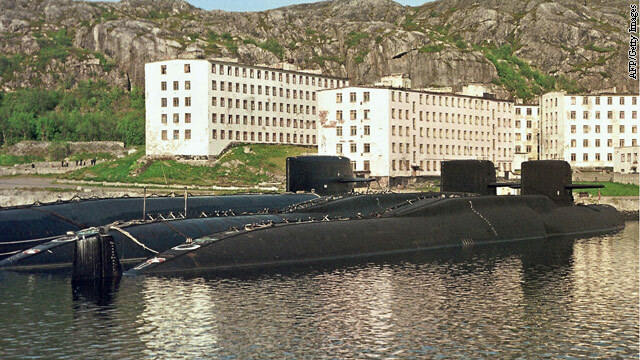 The Sierra-2 class sub is believed to be part of the fleet. The U.S. Navy detected and tracked a Russian nuclear-powered attack submarine less than 300 miles from the southern U.S. East Coast last month, according to U.S. defense officials. The move by the Russians to put the ship close to the U.S. demonstrates its desire to ramp up deep-water patrolling by its submarine fleet - something the Russian government has said it would do, officials said. The newer Sierra-2 submarine is thought to be part of the Russian Northern Fleet, and this is the first time this class of sub has been detected this close to the U.S., the officials said. The sub was discovered about 275 miles off the southern East Coast in international waters about two weeks ago and has been followed by the Navy since, defense officials said. Officials said the sub did not come close to the major U.S. Navy submarine base at Kings Bay, Georgia, home to attack and ballistic missile submarines. "Things worked the way they were supposed to," according to one of the officials when referencing how the Navy discovered the submarine. While the officials would not disclose how the submarine was detected, the Navy has sensors in the air and water to detect and track such vessels. The submarine has since turned back, and on Tuesday, it was about 600 miles off the U.S. coast heading eastward toward Europe, according to Navy officials. It is not clear what the submarine was doing this close to the U.S., but officials say they assume it was conducting anti-submarine exercises, a return to a Cold War activity. "They are doing what the U.S. does, patrolling and conducting exercises," one of the officials told Security Clearance. The detection of the sub was first reported in the Washington Free Beacon. The Sierra-2 is similar to the U.S. Los Angeles-class attack submarine and does not carry ballistic missiles - only torpedoes and other anti-submarine weapons. The last time a Russian sub was detected close to the United States was in 2009, according to defense officials.